When you arrive at THE VUE , you’ll know you’re in a special place. As you’re welcomed by the doorman, you’ll step into a gorgeous museum-like setting complete with art exhibitions, a ceiling that features a large fresco and lighting that compliments the art and architecture. The entire scene is complimented by warm, rich travertine and millwork. 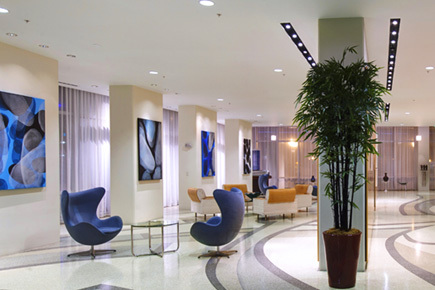 Also in the lobby, you’ll find concierge services available to residents.